Everyone needs a treat once in awhile! I am always on the look out for more natural options so that I can treat myself while doing the least amount of damage to my diet. (I know that I am also often driving my husband insane as I comb through ingredient list after ingredient list.) Recently, I tried Oogave's Natural Soda. I do love to get my soda-fix in now and then. However, I always feel guilty when it comes to those pesky ingredients. 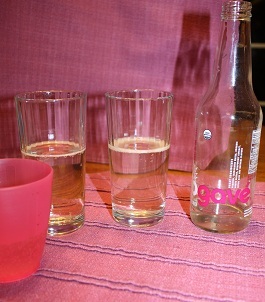 Oogave is a great option for a carbonated treat because it is not full of all of the chemicals found in other sodas. It is made from natural ingredients right down to the agave nectar that sweetens the bubbly beverage. A little about Oogave: Esteban Anson was running a small natural foods restaurant in Denver when he was inspired to create all natural sodas. With his commitment to serving his customers products that were all natural, he recognized that there is a paucity of such products in the soda industry. With his preferred sweetener, agave nectar, in hand, he developed a healthier alternative to the average soda. He began serving the sodas in his restaurant in 2005 and they have been catching on ever since. The flavors: When I first thought about trying a natural soda, I had no idea that there could be so much variety. Oogave has 8 flavors! The flavors are watermelon cream, ginger ale, cola, vanilla cream, mandarin key lime, grapefruit, strawberry rhubarb, and root beer. So, how did they taste? We have tasted the grapefruit, mandarin key lime, vanilla cream, and ginger ale varieties so far. We found each of them to be crisp and refreshing--just what you want in a soda. With none of us liking grapefruit, we were very surprised to love the grapefruit flavor so much. We also found the mandarin key lime to be enjoyable and refreshing. The vanilla cream was a little too vanilla for us. The ginger ale had a truly fresh ginger taste. If you love ginger, this is a great soda for you! All in all, a successful tasting venture and the discovery of a new product that we love! Some more interesting things about Oogave: There is so much to learn about this awesome company! Oogave's sodas are not only all natural but they are also certified organic. Also, Oogave has some neat things on their website including a farm-to-table story about where Oogave comes from. Take a look here! Also, each bottle is only 100 calories. Much better than a can of traditional soda! Now, for some fun for you! Oogave has so generously offered to send a randomly mixed 12 pack of soda to one lucky reader! To enter, just follow the rafflecopter below. The giveaway will end on 12/6/12. The giveaway is open to US residents 18-years-old or older in the lower 48 contiguous states. Oogave will mail the prize to the winner. The winner will have 48 hours to respond to our email or the prize will be forfeited. Enter for a chance to win this all natural indulgence! **Disclosure: We received Oogave soda to try in order to make an accurate review. All opinions are 100% our own. I would love to try the ginger flavor. The ginger ale sounds great! I think Vanilla Cream or Root Beer would be the best! Interesting. Haven't heard of this drink before. Vanilla cream or ginger ale... can't decide. The strawberry rhubarb sounds fun! I'd like to try the root beer. Thanks for the chance! Oooh, I'd love to try to strawberry rhubarb! I would love to try root beer! The watermelon cream sounds great! the grapefruit sounds really refreshing! Definitely the Watermelon Cream!!! Love fruity 'sodas'! The watermelon cream sounds awesome!